Tapioca Maltodextrin N-Zorbit M is a modern starch thickener that is designed to have a very low bulk density making it ideal to increase the volume of dry mixes and to stabilize high-fat ingredients which can then be transformed into powders. Tapioca Maltodextrin dissolves completely when in contact with any liquid. Tapioca Maltodextrin N-Zorbit M is used in modernist cuisine to convert high-fat liquids into powders that melt in the mouth, to make oil nuggets, oil pastes, edible films, edible soil and to thicken fruit puree with high water content to make dehydrated crunchies. Also called Malto and Maltosec. Tapioca Maltodextrin N-Zorbit M is a sweet polysaccharide produced from tapioca through partial hydrolysis and spray drying. The surface of this modified food starch is fuzzy so that micro droplets of oil stick to it almost instantly. Tapioca Maltodextrin N-Zorbit M is primarily used as a bulking agent and to stabilize high-fat ingredients which can then be transformed into powders. 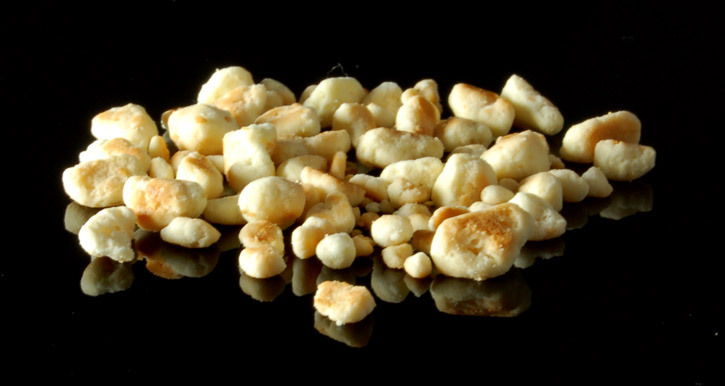 Tapioca Maltodextrin N-Zorbit M is used in modernist cuisine to convert high-fat liquids into powders, to make oil nuggets, oil pastes, edible films, edible soil and to thicken fruit puree with high water content to make dehydrated crunchies. Making oil powders with Tapioca Maltodextrin N-Zorbit M is very easy and oil powders have a great impact on presentation and dining experience. You can practically use any ingredient with high fat such as oils, nutella, caramel, rendered fat from bacon, chicken, Parmesan cheese or other foods. Keep in mind that you can use nut oils such as peanut or hazelnut, sesame oil and flavored oils. You can also make your own infused oil for more options. A classic powder frequently used in molecular gastronomy is the olive oil powder shown below. You can also change the texture of the oil powder to create crumbs or nuggets by heating it in a saucepan or baking it. Below are some olive oil crumbs. Tapioca Maltodextrin N-Zorbit M can also be used to make edible sand or soil as in this incredible sea garnish. In a similar way you can make oil pastes using Tapioca Maltodextrin. You can also use Tapioca Maltodextrin to make brittle opaque films of vegetables and fruits using a dehydrator. Another convenient use of Tapioca Maltodextrin is to dust marshmallows instead of powder sugar if less sweetness is desired. Flavor release: excellent. Tapioca maltodextrin has no flavor and is slightly sweet. Concentration Range: start with 40% of Tapioca Maltodextrin to make powders from oil and add more in small quantities until the desired consistency is achieved. Use a little less to make oil pastes. 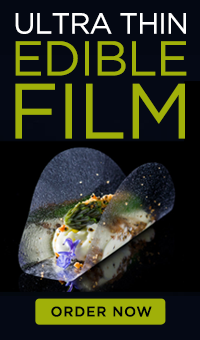 Use 20% to make vegetable and fruit edible films. To make oil powders, whisk together the chilled liquid fat with Tapioca Maltodextrin in a bowl until it converts to a powder. Slowly add the oil while whisking the powder. You can also use a food processor if you are making larger quantities. To make it fluffier pass it through a tamis and reserve in a sealed container until needed. 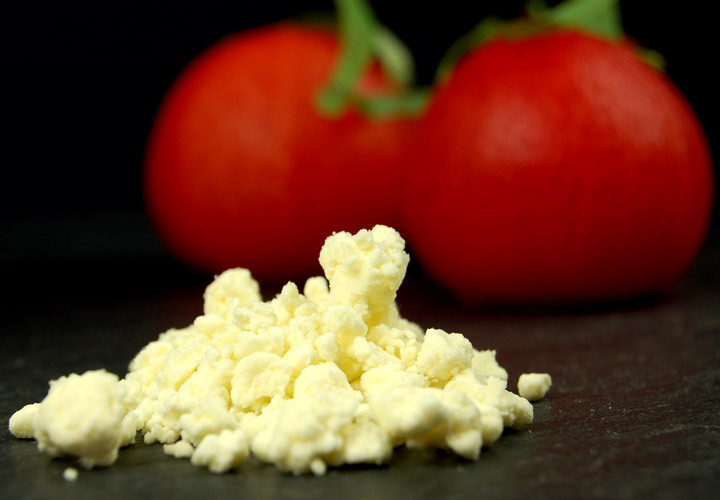 To make a brittle and opaque edible film use 20% Tapioca Maltodextrin with fruit and vegetable puree, cast onto flat surface and dehydrate at low temperature for several hours.